You’d better believe that the “Property Brothers,” Jonathan and Drew Scott, know how to open up a space: Knock down a wall already! But since demolition is a pain and not always effective, what else can you do? The latest episode of “Property Brothers: Buying and Selling” is full of ideas. In the episode “Baby on the Way, Sell It Today,” Nick and Catherine of Ontario, Canada, need to sell their two-bedroom, two-bath house, which is way too small for their growing family (and two dogs to boot). Their current house is relatively new, in good shape, and has an open floor plan, but it’s been sitting on the market for six months—probably because it looks small and cramped, according to Drew. Drew estimates that the house is worth only about $595,000 as is, but Jonathan promises that if they can spare $30,000 and four weeks for the renovation, they’ll be able to get at least $650,000 for the property. And get this: He accomplishes this without even changing the home’s footprint! Here’s how he pulls it off, and other tips that could come in handy in your own home. A quick and instant fix to make more space is by removing some furniture and rearranging the rest to create walkways through the open space. The Prop Bros prove this simply by lifting a couch and moving it to a more convenient spot that doesn’t block foot traffic. Voilà! A magical transformation in about 10 seconds. 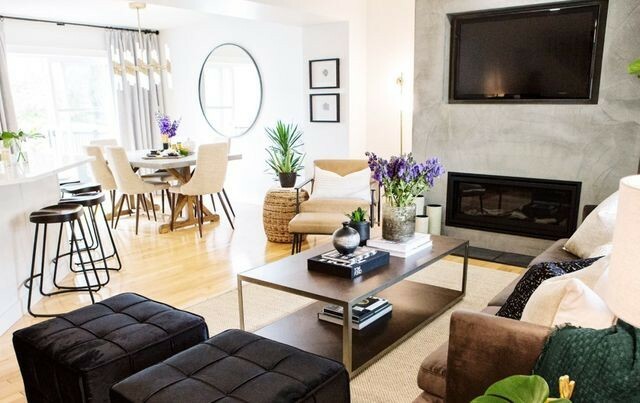 The first thing Jonathan and Drew notice when they walk into the couple’s current living room is that the bulky fireplace juts out and takes up half the space in the room. “It’s a monstrosity!” says Drew. So Jonathan says he’s going to “put the fireplace on a diet,” ripping out the old structure and adding a sleek new cement surround that projects only a few inches from the wall and goes all the way up to the ceiling, pulling the eye up. Now the cramped room looks so much more spacious! A sleek, lower-profile fireplace opens up more space in a room. Nick and Catherine’s open kitchen doesn’t look ancient, and it does have an island. It just looks small and cramped. 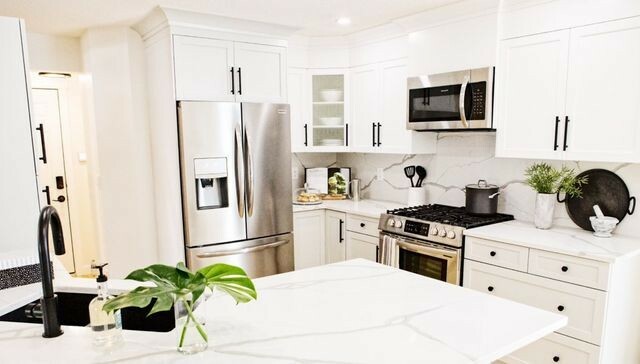 The first thing Jonathan suggests is removing the old black stove and refrigerator (which don’t fit the space anyway) and replacing them with nice, light, brushed stainless-steel appliances that subtly reflect light, rather than absorbing it, as the black appliances did. The walls in most of the house were a sort of dark taupe, so Jonathan paints the entire great room, including the kitchen, a lovely, warm white that seems to magically expand the main floor. He also sprays in white the existing cherrywood cabinets (they’re still in good shape), which makes a huge difference. The kitchen seems a lot more spacious, now that everything has been lightened up. One of the reasons the kitchen seems so small and dark is the fact that it has only a few lights hanging down from the ceiling, and they don’t illuminate much. Jonathan promptly removes those lights and easily replaces them with more strategically placed recessed lights, using the same wiring so he doesn’t have to rework the entire electrical system. The kitchen counters are black, which used to be considered elegant, but now just make the room feel dark and small. So Jonathan removes them and replaces them with nice, white quartz. The kitchen now absolutely gleams. Does a basement bedroom count? Not in Ontario, apparently, even if it has a window and a closet. Catherine and Nick have always had plans to finish their basement with a bathroom and a bedroom so they can advertise the home as three bedrooms, three baths, but Drew tells them to hold off. “On a listing sheet, you can only list above-ground bedrooms,” he says. However, he adds that building extra rooms in the basement will nevertheless increase the home’s value, because you can advertise bonus space. It’s always best to check the local requirements when you include basement and/or garage space on your listing. Once Jonathan has worked his magic for the $30,000 estimate in the promised four weeks, Drew advises that they list the home right at $660,000, and that he’s sure they’ll get multiple offers. Sure enough, they do, in a very short amount of time. Nick and Catherine accept the highest bid, which is $5,000 over asking! Do the Property Brothers deliver? There’s always that moment on “Buying and Selling” where you think Jonathan has done such a magical renovation that the family will decide to keep their old house after all. But, as always, Drew works a little magic of his own, and finds Nick and Catherine a beautiful, newish house that they love. They decide to raise their original budget of $775,000 up to $795,000 to pay for it—hey, they got more money than they expected for their old house anyway. Everyone involved, including the dogs, are thrilled. Nick and Catherine’s dogs show their gratitude to Drew. The post The Property Brothers Reveal How to Open Up a Space—Without Knocking Down Walls appeared first on Real Estate News & Insights | realtor.com®.